Shane van Gisbergen charged from fifth on the grid to score his first victory for Red Bull in the opening V8 Supercars heat at Albert Park. The Kiwi snuck down the inside of Chaz Mostert at Turn 1, before making his way around a warring Fabian Coulthard and Mark Winterbottom later in the opening lap. A Safety Car intervention followed to recover the Nissan of Todd Kelly, which pulled off on the front straight in a cloud of smoke. Pole-sitter Jamie Whincup was able to fend off team-mate Van Gisbergen on the double-file restart, but proved unable to hang on for long. Locking a left-front as he defended into Turn 13, Whincup ran fractionally wide, allowing Van Gisbergen to take the place. 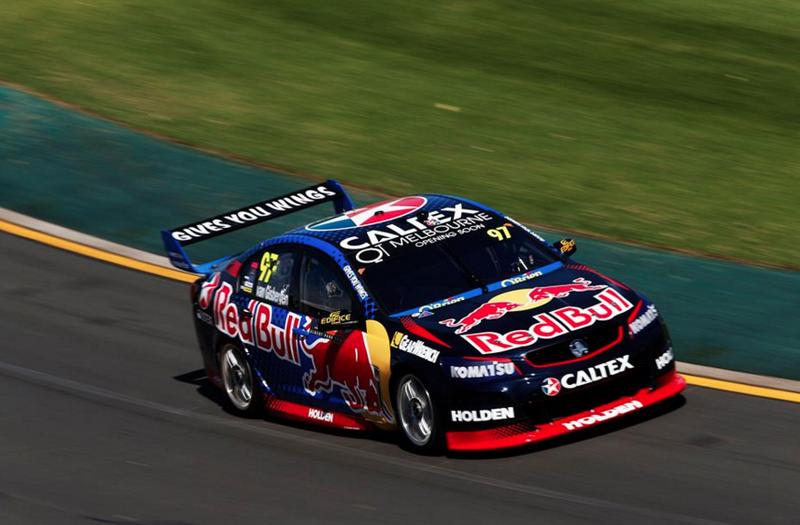 Just 0.5s separated the Red Bull duo at the flag as Whincup tried his utmost to redeem his error in the closing stages. The race was eventually called a lap short of its scheduled 12 lap duration due to the lengthy early Safety Car. Mostert lost third to Coulthard on the restart, but regained the place with a clean move on his Ford rival into Turn 3 on lap 9. Coulthard had earlier spun Mostert’s team-mate Winterbottom at the high speed Turn 11 as the pair battled for third on the opening lap. Winterbottom found himself facing backwards after turning in on the DJR Team Penske Ford and eventually finished down in 21st. Scott Pye drove from 10th on the grid to fifth having survived an opening turn tangle with Jason Bright that spun the Team BOC Holden, which was subsequently parked with damage. Garth Tander carved his way from 15th to sixth ahead of Craig Lowndes, James Courtney, Scott McLaughlin and Cameron Waters. The second of four V8 Supercars races for the weekend will take place from 1820 this evening.